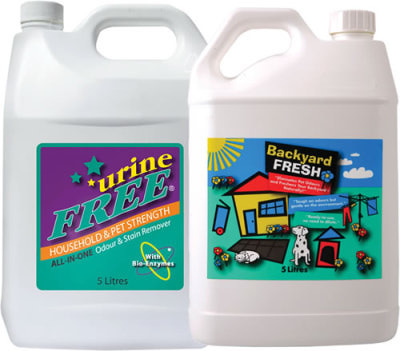 We supply both UrineFree and Backyard free in 5L bottle, as it is a more economy option. Buy both to receive 15% discount! urineFREE’s bio-enzymatic formula “eats up” the urine and uric acid crystals whilst removing the urea and urochrome components, eliminating both the urine stain AND the urine odour for good. Synthetic grass is usually built on crush rock and sand base with small holes in the material to allow for drainage. When the synthetic grass has been urinated on, it is very likely that the urine run-off has seeped through the grass, into the rock and sand and will remain there. Once humidity or heat penetrates the grass the uric acid crystals (the source of the urine smell) activates and releases the urine odour. When urine dries it crystalises and it is these uric acid crystals that are difficult to remove. Conventional cleaners and just water will not break down the non-soluble uric acid crystals and they will remain as will the odour. Only a bio-enzymatic formulation found in urineFREE® will remove uric acid crystals for good. urineFREE’s bio-enzymatic action is designed to “eat” these crystals along with the urea and urochrome components of urine and eliminate the urine smell for good. However! When it comes to treating urine odours in your backyard it is not alwaysnecessary to make sure the urine deposit is removed each time because many pets will frequently visit your garden beds, synthetic grass / artificial turf or their favourite spot. Permanently removing urine deposits on these areas on a continuous basis could be a costly exercise! How much urineFREE do I need to eliminate the urine in my synthetic grass? The amount of urineFREE you are going to need depends on the amount of urine that has been deposited and the porosity of your synthetic lawn. For example one dog (depending on size) can urinate between 200-2000ml each day. Over 365 days this is a large accumulation of urine. Therefore we cannot recommend an exact quantity as every case is different. The more urine you have the more urineFREE you will need to eliminate the urine for good. We offer 5 & 10 Litres for larger deposits but in some cases more may be required, especially for ongoing maintenance. If your pet is going to revisit this lawn then complete removal is costly but regular maintenance to remove some of the urine using urineFREE will help reduce the long term odours. BackyardFRESH can be used to provide temporary relief in between urineFREE treatments. Please note: The Synthetic Grass Packages we suggest are only a guide. In some cases it will be sufficient to solve the problem, in other cases it may not be enough. If the lawn has been urinated on over a long period of time more urineFREE may be necessary to complete the job. It is important that you saturate the grass with urineFREE so that urineFREE penetrates into the drainage holes where the urine has seeped and makes contact to remove the underlying urine odour. urineFREE must come into contact with all the urine to be 100% effective. If you can pull back the synthetc grass as various corners and treat the crush rock or sand base and underneath the synthetic grass mat directly this will lessen the amount of urineFREE required. Do not treat the lawn on hot days as it will cause urineFREE to dry too quickly reducing its effectiveness. The evening when the sun is down is best. Do not treat the lawn during rain as it will dilute urineFREEand reduce its effectiveness. Some customers use a plastic sheet to cover the synthetic lawn during treatments to keep urineFREE moist for as long as possible. When it is moist it is still working. One hour to overnight would be sufficient time. After the first application, allow to air dry, then hose down the grass to remove the residue from the biological activity. It may take more than one application on old urine or for larger deposits. The sniff test will tell you when you’ve got it all. Once the odour is gone and if the grass is still being used by your pet then apply weekly for maintenance or as required. Alternatively you can use BackyardFRESH to control urine odours in between urineFREE treatments to reduce your ongoing maintenance costs.